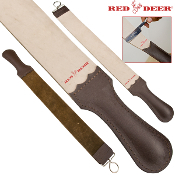 This high quality double-sided strop is made with genuine leather. This is a real leather strop with a dual side feature. Each strop comes with two sides: leather and linen. The leather is for sharpening and maintaining the perfect edge while the linen side is for cleaning off the surface of your razor. Use the fabric side first and then strop away with the leather side. Stainless steel hanging hook.